DSAOC receives local Corporate support! Do you ever wonder how you can get your company involved in helping to raise Down syndrome awareness, and raise funds for DSAOC at the same time? One of our awesome moms, Ericka, works at 3 Point Asset Management and asked her HR Dept to consider DSAOC for one of their ’cause’ months. Employees pay a small fee to be able to wear jeans Monday-Thursday. Once they pay, they receive a ticket that grants them ‘jeans’ for a day, and the ticket also contains information on where donations are going for that particular month. 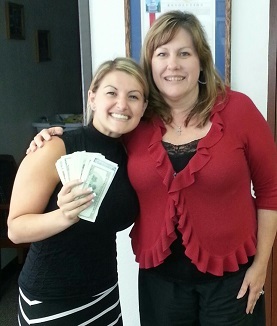 McKenzie Keller, from the company’s HR Dept, visited with DSAOC today and dropped off June’s donations totaling $1,040.00 – WAY TO GO everyone at 3 Point Asset Management – THANK YOU! Posted in Uncategorized | Comments Off on DSAOC receives local Corporate support! 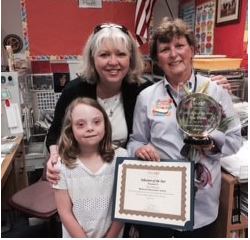 The Down Syndrome Association of Orange County received several nominations for the 2013-2014 Educator of the Year Recognition program. We sincerely thank all of our nominators for taking the time to put in writing all the wonderful ways their child’s education team is making a difference in their loved one’s life, and we are grateful to all of our nominees for the positive impact they are making on children in Orange County. Our First Runner Up is Mr. Bruno Lopez Membrano from Lord Baden Powell. He was nominated by the Avalos family. We would like to give Honorable Mentions to Mrs. Joan Hersh from Gisler Elementary, nominated by the Miranda family, and Mrs. Dede Van Etten from Schroeder Elementary, nominated by the Ontiveros family. DSAOC is thrilled to recognize Mrs. Laurie Stotz, an RSP Teacher at Robinson Elementary, and Mrs. Alta Primus, an Aide at Robinson Elementary. Nominated by the Unter family, this education team has done a fantastic job contributing to their child’s scholastic success, as well as boosting confidence and a love of learning. DSAOC staff member, Kristi Golden, attended a special school assembly this week to recognize Mrs. Stotz and Mrs. Primus for their dedication and belief that ALL children can learn and are deserving of a positive and challenging learning environment. We will have more details in our upcoming Optimist Newsletter about the amazing work these educators do every day, so stay tuned!